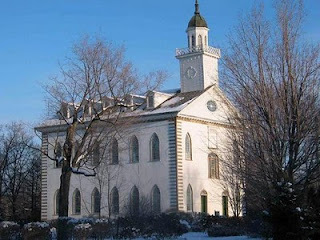 On Sunday, March 27, 2011, I am conducting a 52-voice chorus and orchestra in performance at the Historic Kirtland Temple, in Kirtland, Ohio, a National Historic Landmark. We are commemorating the 175th anniversary of the dedication of the Kirtland Temple on March 27, 1836. Speakers and musicians are from the Akron, Cleveland, Youngstown, and Kirtland areas. Our choir and orchestra are performing "My Shepherd will Supply My Need" and "The Spirit of God," both arranged by Mack Wilberg, conductor of the Mormon Tabernacle Choir. Orchestra members are professional musicians from around the region and will play a musical prelude including original hymns sung at the dedication in 1836. Services will be at 7:00 a.m. and 6:00 p.m. with overflow viewing at the Temple Visitor's Center, 7809 Joseph Street Kirtland, OH 44094 (440) 256-1830; and at the Kirtland Stake Center, 8751 Kirtland Road, Kirtland, Ohio. (You must have a ticket to enter the temple services).